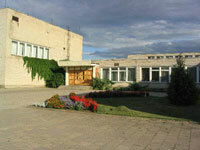 Uzupio secondary school is in the town of Ukmerge which is 70 km from Vilnius, the capital of Lithuania. Our school is one of the oldest schools in Ukmerge, 751 pupils learn here. Everyone is very friendly, helpful and supportive, so if you need any assistance you can definitely turn to them. Teachers are very professional and always eager to help their students acquire knowledge. You can always find delicious and cheap meals in the canteen of our school. The council of pupils is working to make sure the process of learning is not draining or mind-numbing, but fun too. There are unlimited possibilities to do sports and stay fit because we have a superb basketball court and football pitch and lots of various equipment. There is also a wide range of after school activities and clubs to choose from, so you will never be bored. Besides, our school always celebrates different occasions and organizes various events or actions, so everyone is involved. We are looking forward to seeing you in our school. Everyone can say it for you. If I want to learn new interesting things. Our English books are "Shine"
Learn we all the time like this. You should come to see us too. We learn much from "Shine"
ZM Our school day starts at eight. I don't want to be too late. English is the number one. When I learn exciting things. It's like I will get my wings. We learn things about the world. This knowledge never gets old. Exploring all new things each day. I want to reach the Moon. With some help from a racoon. 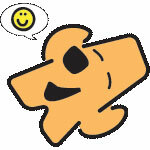 Welcome to the GiggleIT Projects online travel blog. This is the place you can follow Mr Giggle’s travels around the world as he accompanies children from our participating Special Envoy Schools. 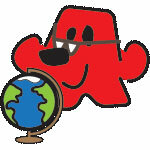 These schools act as consulates for Mr Giggle, protecting and keeping him safe on his travels around the world. Mr Giggle is the world ambassador for the GiggleIT Project. Special Envoy Schools can take a photograph of Mr Giggle in different parts of the world, country, local area on school trips, or just relaxing around school. These are then sent back to the GiggleIT Team to be displayed up on the website (Traveldoc) with accompanying text which allows your students to practice English writing skills and or speaking skills about their special area of the world and their travels with Mr Giggle. So for example if a Special Envoy School takes a school trip to the snow fields, Mr Giggle can go too! His travels are then sent back to the GiggleIT website for upload. Schools may choose to present video of Mr Giggle's travels, but this must be hosted on the school site Submit the URL to the GiggleIT team and a link to the page hostingthe video will be provided from the school's GiggleIT webpage. Mr Giggle enjoys the Advent Wreath celebrations with his students and teachers from Ukmerges Uzupio Secondary School in Lithuania. This school is a Special Envoy School of the GiggleIt Project. Students and staff of Ukmerges Uzupio Secondary School include Mr. Giggle in their festivities, preparing for Christmas in Lithuania. 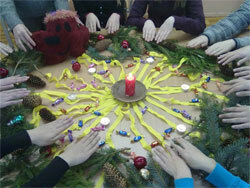 The English class students, staff and Mr Giggle are making an Advent wreath together. The Advent wreath always has candles - this one includes fresh evergreens, cones, apples, and glass ornaments, too. Mr. Giggle is happy to see that candy is also part of this Advent wreath! If we roll up each candy in a ribbon, then we can unroll one each day of Advent and enjoy the sweetness as we countdown to Christmas. Candles light the dark winter's night as Lithuanian children await Christmas.